As an early Fathers' Day celebration, we spent Saturday on the road, taking in local gun shops and local breweries. What else would you expect? Our first stop was the recently opened Airsoft GI Tactical store in Richmond. 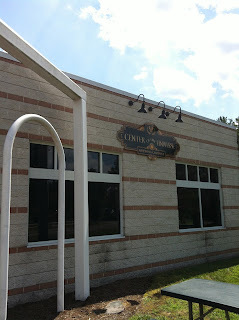 Our son frequently participates in air soft games so this stop was ostensibly for him, but I wanted to look around too. No sooner did we walk in the door did I spy an air soft replica of the SIG P226 I use in USPSA competition. Knowing little nothing about these guns, I spent just about the entire visit chatting with the store employee about it. I was sorely tempted when he offered me the chance to try it out in the store's range, but I declined. Next time perhaps. Next we moved on to the iconic Green Top. I was simply interested in browsing, and also picking up another NEVCO target stand to add to my assemblage. (Like ammo, one can never have too much target paraphernalia.) While looking at the stands, I spied some clay stands, designed to hold clay pigeons for shotgun practice. We typically prop the clays up on tree stumps and other assorted pieces of wood, but these metal holders would add some height and variety. So my family decided a few of those would go along with the other stand for a Father's Day gift. Ties are cliché, shooting accessories make the preferred gifts around here! That done we headed up the road to Bass Pro Shops. Again, just for more window shopping, but first, food. 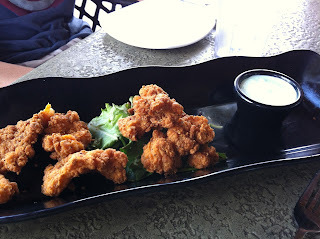 We decided to eat at the in-store restaurant and I jokingly pointed out the fried alligator appetizer featured there. Except I wasn't joking, I fully intended to order it. (BTW, it doesn't taste like chicken.) The appetizer, along with a tasty oyster po-boy made for a filling lunch. Browsing through the shooting sports section followed the meal, and then it was time to move on to the beer-focused part of the day. The first stop on this leg was Center of the Universe Brewing in Ashland. There I enjoyed a pint of Ray Ray's Pale Ale. This ale has a fresh, almost green, bitter and citrus hop profile, and was very tasty. Colleen went the malt route with a Main St. Altbier. I took a couple sips from her cup, and could detect the rich malt flavors, but my palate was too tainted from the lingering bitterness of the pale ale to get a proper impression. I enjoyed my beer very much, though I was a bit taken back by the disposable plastic cups being used. Perhaps that's a choice made in deference to the outdoor patio service. We arrived at the brewery just a few minutes after the 3:00PM opening time, and watched the place fill with people quickly. It seems to be a popular Saturday afternoon stop and there was soon a long line for beer. I did pick up a bottle of Homefront IPA to bring home, which will be the subject of a future review. I typically prefer to pick just one or two beers at a new place and enjoy a full-size serving, however I was undecided on what beer to try, so I broke from my usual routine and opted for a flight of all five beers. Of the five, Colleen and I both enjoyed Roy's Big Bad Brown Ale and The Quake Stout the most. The Brown Ale had a subtle chocolate and brown sugar flavor with a mild bitterness. The Stout had a mild espresso flavor. There was nothing extreme about the Rusty Beaver beers, and they were all drinkable. Since we only had small tastes of each, I brought home a growler of the Brown Ale for a more in-depth review in the near future. I spoke to brewer Austin and his plan for the future is to brew larger batches at the nearby family farm, and use the small system at the store front for small batches of special beers. I wish him the best of luck and I look forward to stopping in again. It was a very enjoyable trip. We at some good food, looked at some firearms, and enjoyed a few new beers. The fun will continue soon at the range with the new target stands, to be followed by even more beer to enjoy. Thanks to my wonderful family for a fun day! Get a bunch of large (not too large) zip ties and thread each one through itself to form a "knot" at the end. Staple a solid piece of cardboard up on your standard target holder, then thread the zip ties through your drilled clay pigeons and through holes punched in the cardboard. You can usually get about 20 clay pigeons up on one target holder. Set that puppy at 100yds and plink away. Good hint, MSgt B. Sounds like some good pistol challenge in there too.